There are lot of movies in theaters right now trying to grab your attention, and dollars, from big superhero spectacles and musical extravaganzas to awards darlings and wannabes. It’s easy to get overwhelmed with the options in the multiplex (and, frankly, at home) and when something like, say, a late-career Laurel and Hardy biopic comes along, you’d be forgiven for thinking it easy to dismiss, or at least put off for a little while. But I’m here to tell you not to sleep on “Stan & Ollie .” It is simply terrific — an understated but smartly told crowd-pleaser about the legendary comedy duo in their last act, with wonderful production value, a sharp and surprisingly poignant script and brilliant performances from John C. Reilly, as Oliver Hardy, and Steve Coogan, as Stan Laurel. Directed by Jon S. Baird (“Filth”) off a script from Jeff Pope (“Philomena”), “Stan & Ollie” focuses in on the two during a last-gasp musical hall tour of the United Kingdom in 1953, 16 years after their prime, when most of the world had assumed the two had long-since retired on the riches of their fame. There is a brief introduction of them at their peak working with Hal Roach (played by Danny Huston). They’re laughing about ex-wives and money and declaring that they’ll never get married again, or, as Laurel says, he’s just going to find a woman he doesn’t like and buy her a house. But there’s a sign of trouble to come. Laurel’s contract with Roach is up, and he’s taking a meeting at another studio, expecting (and hoping) that Hardy will come along. The film comes back to this pivotal break throughout, as we learn more and more about that rift and their lingering issues with one another and the seams of this showbiz-manufactured marriage start to show even as this performance tour gets more and more trying as it becomes evident that this is their last act. It’s a rough go on the road at first, as they try to keep their spirits up even when performing to a half-full, second-rate theater (a lousy promoter has not done a good job educating the public that they’re not retired). Eventually they have to lower themselves to do a series of cheesy promos educating the public that yes, it is them and not some impersonators, which ends up working. Abbott and Costello might have been the big screen comedy duo of the moment, but it turns out there was still an audience for nostalgia. And there is more at stake than just their ego — Laurel has been hard at work on a Robin Hood movie that he hopes could be their big comeback (a producer is supposed to come see their London show), while Hardy is trying to mask his declining health. 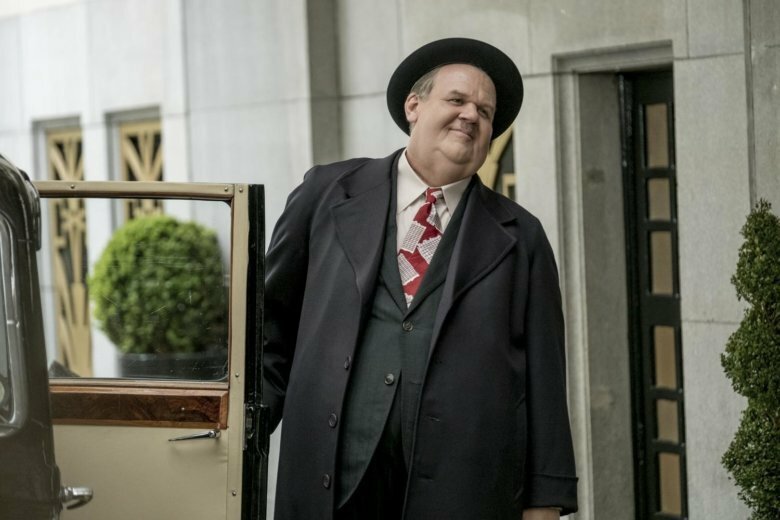 “Stan & Ollie” packs a surprising emotional punch as well, without ever delving into the sad clown sentimentality that you might expect from a standard performer biopic. Whatever is going on behind the scenes, in their friendship, their marriages, with their finances, these two seem to relish in delighting an audience, whether it’s just one person (like, say, a hotel clerk) or a room of thousands. They’ll even get their wives (Shirley Henderson plays Lucille Hardy and Nina Arianda is Ida Kitaeva Laurel) in on it to drum up a little publicity, making them participate in “the door bit” fresh off an international flight. And Coogan and Reilly are at the top of their game, truly disappearing into the icons they’re playing. Baird and his performers have fun integrating these well-worn bits (even the piano box!) into their daily life and Laurel and Hardy fans will have fun spotting them throughout. And don’t worry if you’re only passingly familiar with Laurel and Hardy — their comedy is timeless and it’s not an uphill battle to understand why they were the best, or to see their impact on the comedy of generations to come. “Stan & Ollie,” a Sony Pictures Classics release, is rated PG by the Motion Picture association of America for “some language, and for smoking.” Running time: 97 minutes. Three and a half stars out of four. MPAA Definition of PG: Some material may not be suitable for children.